Rohingya refugee Mariom Khatun, 25, holds her baby Firuz Ahmed, 5 months, as they rest on the banks of the Naf River following a six-hour ordeal crossing the river on a makeshift raft made of bamboo and empty plastic oil containers tied together with rope, in Cox's Bazar District, Bangladesh. Before you say "priceless" without a second thought, ask yourself again — only this time imagine you are starving and you haven't eaten in weeks. You are sick from drinking the only contaminated water off the ground that you could find. You are drenched from sleeping under trees and tarps. Your spouse is missing and possibly dead. You are having flashbacks to the brutal violence that made you flee your home and everything you ever knew, and walk for 10 days straight just to find help. And you have three children in your arms, each looking to you through teary, traumatized eyes, in desperate need of safety, protection and answers. 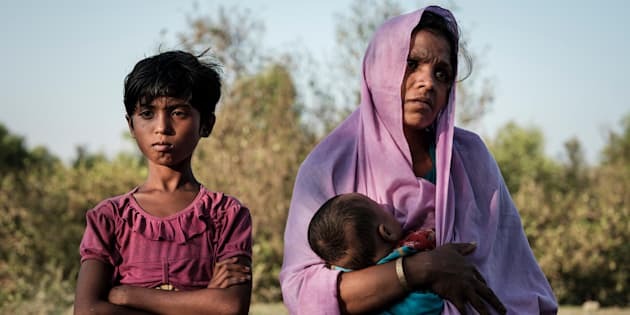 In the case of the Rohingya — Muslim refugees who have been forced to leave their lives and livelihoods behind in Myanmar after being caught in what some have called "a textbook case of ethnic cleansing" — that desperation is leading to danger for many children. In these circumstances, parents with little source of income may become willing to take on whatever opportunities they are promised, even those that are dangerous and that involve their children. They seek safety — and a means of survival — in Bangladesh. Ask yourself again: how much would you pay for your child to have a way out? This is the excruciating dilemma faced by the Rohingya. I have been witness to this crisis for the past three months. As a Canadian, this is far from the life I have ever known. Since August 2017, more than 655,000 Rohingya refugees have sought refuge in Bangladesh, and more than half of them children. Humanitarian agencies like UNICEF have been rushing to meet the immediate needs — food, shelter, safe water — but the demand is far outpacing the response. This is the fastest growing humanitarian emergency in the world today. In the chaos of the crisis and the shadows of the problems we see are those we don't; the invisible plight of children who are at risk of being trafficked in order to make ends meet. The world's collective failure to broker peace is costing Rohingya children their childhoods, their futures and in some cases, their lives. But even once peace comes, this exploitation is setting them down a dangerous path — one that may not be reversible. This is a human tragedy but one that we can put an end to. A recent report by the International Organization for Migration confirms what we on the front lines have seen since the start of the crisis. Living in overcrowded and squalid conditions with little chance of finding work, Rohingya refugees are doing whatever they can to survive. Unfortunately that can mean falling prey to human traffickers along the way. The report indicates that young girls, lured by the promise of a good marriage, ended up being forced into prostitution. Parents, who believed they're sending their children off to a successful job are being misled. This is a human tragedy but one that we can put an end to. We can stop child trafficking by ensuring families have the means they need to support their children. By ensuring their basic needs are met, and that their children have access to education, health services and community child protection systems. Families won't continue to expose themselves or their children to danger if they don't see the immediate need. Canada has already taken great measures to support these vulnerable children. In 2017, Canada committed more than $37.5 million in humanitarian assistance to Bangladesh and Myanmar. This included $12.5 million for the Myanmar Crisis Relief Fund, which matched individual donations made between Aug. 25 and Nov. 28, 2017. Without sufficient funding and greater access and resources to ensure protection for every Rohingya child at risk, children will always have a price tag and remain exposed to exploitation and trafficking. Only a long term solution will put an end to this gruesome violence — one that supports the safe, voluntary and dignified return of Rohingya refugees to Myanmar. Because the answer to the question of how much a child is worth should be "priceless." Every time. Jean-Jacques Simon is Chief of Communications for UNICEF Bangladesh, and originally from Montreal.